Editor’s Note: Noel did it! After competing in 2013 and 2014, he broke through and won a prize at the annual AT&T Developer Summit Hackathon (@attdeveloper). Congrats to the whole team. The whole team minus Anthony who was too sick to enjoy the moment. 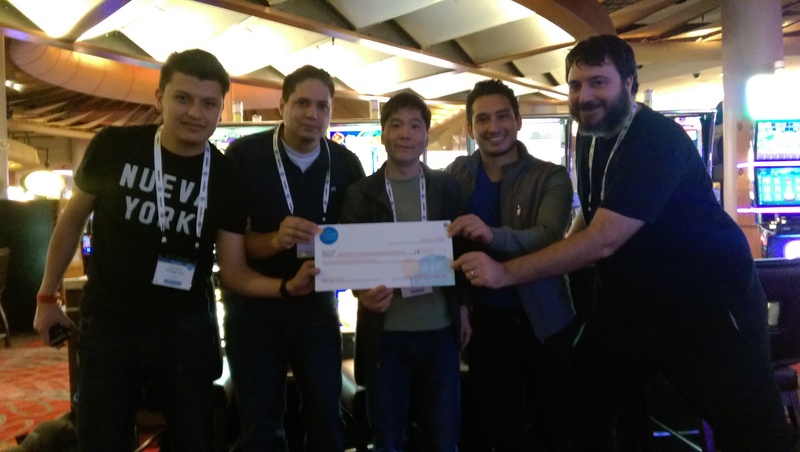 This year, Anthony (@anthonyslai), Raymond, Osvaldo (@vaini11a), Luis (@lsgaleana), Tony and I (@noelportugal) participated in the AT&T Developer Summit & Hackathon. From the beginning we realized we had too much brain power for just one project so we decided to split the group. The first group would attempt to go for the first overall prize. And the second group would focus on just one accelerator price from a sponsor. We knew we only had three minutes to present, and we had to leave an impression with the judges. So, we opted to build our solution around a specific use case with only one persona in mind. The use case was to use our voice to control AT&T Digital Life, AT&T WebRTC and the AT&T Speech APIs. The persona was an older gentleman going around his daily life around the house. We opted to use our latest toy, the Amazon Echo as way to interface with AT&T services. We went to work, found a couple limitations, but at the end we overcame them and we felt pretty confident with our solution. Tony is an 89 year old man and lives alone. He is pretty self sufficient, but his daughter (Cindy) worries about his well being. So she bought AT&T Digital Life to make sure her dad was safe and sound. Tony doesn’t want to be bothered to learn all the new mumbo-jumbo that comes with new technology, like a mobile app, a fancy remote, etc. Instead he prefers to use “Your Voice” to make sure all doors are locked, garage door closed, lights off/on, etc. “Your Voice” also works as personal assistant that can take care reminding Tony of important things, read email, initiate video calls (WebRTC), etc. So that’s it! We pre-programmed sequences to identify actions. When Tony said “Alexa, I’m tired. I’m going to bed,” the system started a series of actions, not just one. When Tony said “Alexa, call my grandson,” the system automatically started the projector and did a video conference. Raymond and Anthony decided to enter the “MediaTek Labs IoT and Wearables Challenge.” MediaTek (@MediaTekLabs) has a very nice multipurpose development board called LinkIt ONE that includes an array of connectivity options (BLE, Wifi, GSM, GPRS, etc. ), plus access to a lot of plug-and-play sensors. They built a sensor station to monitor environmental safety metrics (temperature, fire hazard) and environmental health metrics (noise, dust, UV). They used Android Wear as the wearable platform to notify users when things happen, using an IFTTT model. “Sensus” got the first prize for the accelerator entry. And as team we could not be happier! Hackathons or developer challenges are a great way to work as a team, learn new technologies and push the limits of what can be accomplished on such short time. As a team we have proven to be always ahead of the curve with our solutions, e.g. last year we built a Smart Holster for Law Enforcement, and if you have been following CES 2015, there are some companies doing similar implementations. There is no doubt that voice control will be huge this year. The technology is maturing at a very fast rate and we are bound to see a lot more great implementations. Finally, winning is not everything in these events. The journey is what matters. What we learned along the way. I find it very apt to have this competition in Las Vegas since this place is full of chance, probability and ultimately pure luck. Congratulations! You guys did an amazing job. Be sure to share your strategy on competiting in this event some time if it’s not a state secret. Again, kudos to your team! We’re looking forward to seeing more cool stuff developed using MediaTek LinkIt!